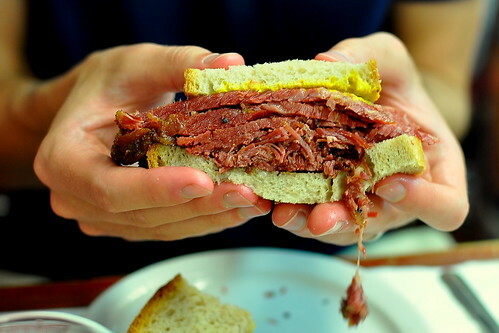 Besides poutine, the thing to eat while in Montréal is smoked meat. 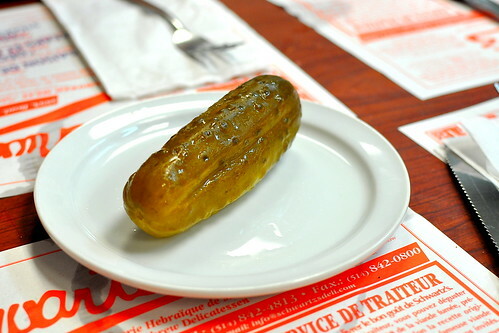 There are a handful of purveyors around town, but Schwartz’s Montréal Hebrew Delicatessen is the most well known and highly regarded. The restaurant was opened in 1928 by a Jewish immigrant from Romania named Reuben Schwartz. The smoked meat is prepared using a secret blend of herbs and spices and marinated for ten days. 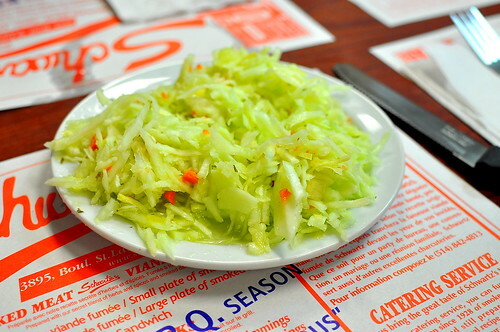 Schwartz’s has employed the same recipe and techniques for over 80 years and takes great pride in serving a preservative-free product. The Astronomer and I, along with our friends Nina, Linda, and Dan, made our way here for lunch on our first full day in the city. 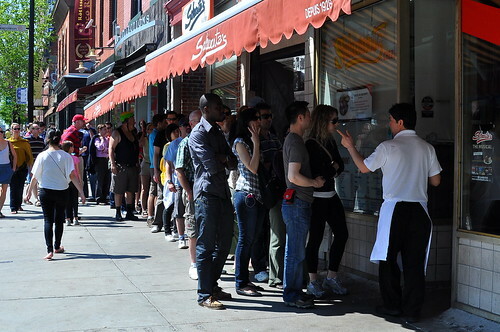 Even though we arrived well past lunchtime, there was still quite a lengthy line outside the restaurant. After waiting for about 30 minutes, we were finally ushered in. Due to the restaurant’s limited space and immense popularity, smaller parties are usually seated with strangers along the long narrow tables that occupy the room. Our group was large enough this afternoon to merit our own domain. 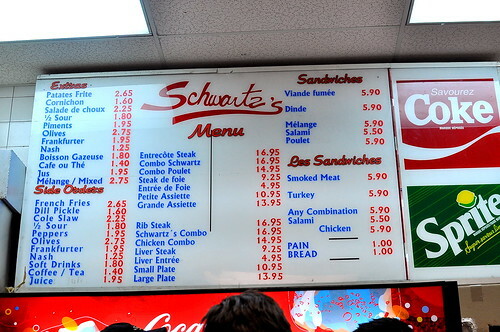 Along the restaurant’s white tiled walls are photos of celebrities who have stopped into Schwartz’s for smoked meat. As luck would have it, a portrait of the incomparable Celine Dion and her adoring husband was hung right next to our table. I would’ve preferred a picture of Alanis Morisette or Avril Lavigne, but you can’t win ’em all. 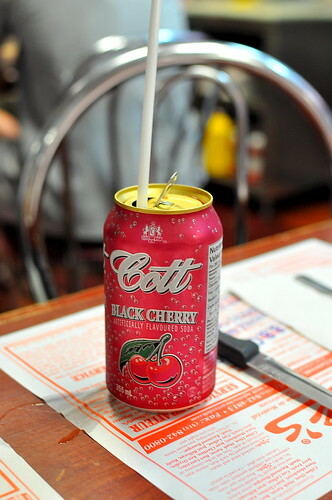 To pair with our smoked meat sandwiches, our hosts Linda and Dan highly recommended Cott’s black cherry cola ($1.90). I totally dig it when Montrealers school me on how to eat like a true local. 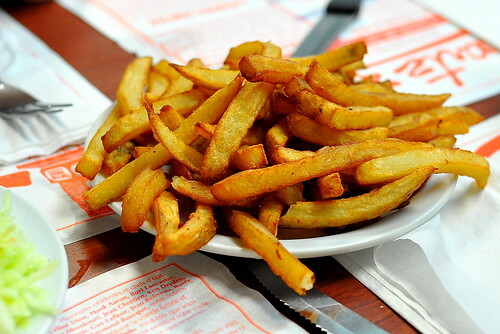 …and homemade french fries ($2.80). All of the sides were perfectly nice, but the stars of the afternoon were the famous smoked meat sandwiches ($6.15). The Astronomer and I ordered ours “medium,” which included a blend of lean and fatty cuts of brisket. “Lean” is also available for those who are fat averse. The hand-sliced meat was stacked tall between two slices of light rye bread with a bit of yellow mustard. The seemingly simple sandwich packed an impressive punch. The meat was flavorful, moist, and tender, while the bread was soft but sturdy enough to keep the meat in its proper place. Mustard, coleslaw, and pickles were just the tangy accompaniments needed to punctuate the wonderful smoked meat. The smoked meat at Schwartz’s totally lived up to the hype. I love it when that happens. How does this place compare to Langer’s or Canter’s with respect to smackitudity? Great! 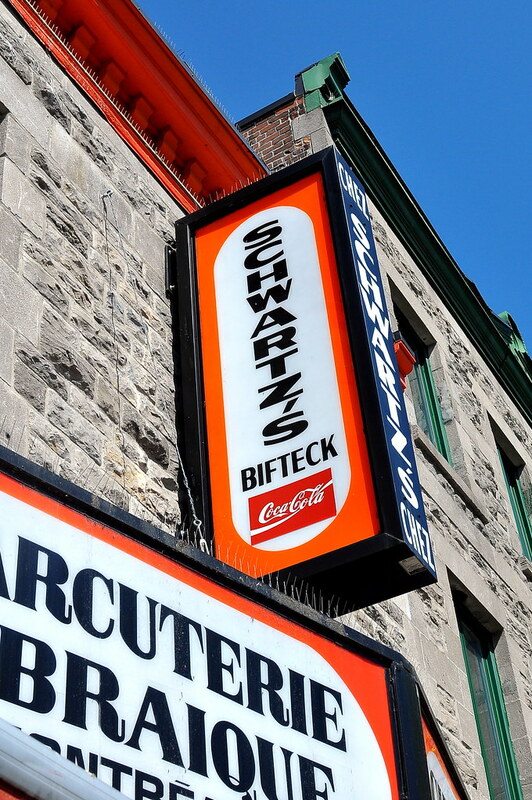 I am going to Montreal next week and I can’t wait to try Schwartz’s. i had this sandwich years ago when visiting montreal. i still dream about it. Dearest Al – What the heck does “smackitudity” mean? If you’re talking deliciousness, Schwartz’s has a slight leg up on Langer’s. The meat is seasoned more aggressively in Montreal, which I can appreciate. The #19 at Langer’s, on the other hand, is in a saucy and cheesy league of its own. I was curious where you had it in relation to Langer’s or Katz. Personally, nothing beats #19 for me. But, I think all three are great. I went in the dead of winter, so the line was just me. My girlfriend and I plan to go next April, so I’m really glad we can leverage off your recent reviews. I hope you ordered a ton at Au Pied de Cochon. That’s such a fun restaurant. Waleed – I just had the #19 this past Friday—LOVED IT! I don’t think it’s fair to compare Schwartz’s smoked meat to Langer’s #19 because it doesn’t contain any fixings other than yellow mustard. 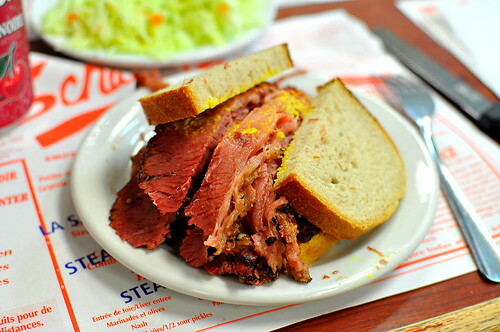 However, it’s definitely fair to compare Schwartz’s smoked meat to a plain pastrami from Langer’s. And on that front, Langer’s meat is slightly under-seasoned compared to Schwartz’s. This place is the bomb! Never had lunch meat that tasted this amazing. Looks like a great sandwich. I’ve been to Montreal several times and some of it on bike. Haven’t sampled Swartz’s sandwiches yet but it looks like a quality sandwich. I did sample their bagels at St. Vitaeur’s…I probably didn’t twig into the fame of the brand at that time. Just wandered in there off the street. holy cows those sandwiches are positively glowing! Was reading on bangkok, searching all over the web for info becuase it had been many years since out last visit, stumbled on your blog and absolutely loved it. Tonight is the third night in a row and i am discovering more and more…….. Yes smoked meat “FAT” and a coke, perfect night cap after a nice meal at le express and lots of alcohol, bringing back the memories, thank you. I am going to be making this next week for the first time. I am really excited and can’t wait. I have never had Shwartz’s version but with all the blogs I have read I can taste it now.